The Accelerated Benefit plan was designed to provide an insured person with high-level coverage on top of any existing benefits while at the same time providing a benefit period that will provide income for the insured person to age 65, 67, or 70. Since this policy is offered as an excess or supplemental policy, the insured person must have underlying group and/or individual disability coverage in force. 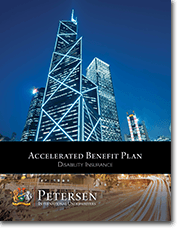 When the insured person becomes disabled and the elimination period is fulfilled, the insured person will begin receiving monthly disability insurance benefits. If the insured person is totally disabled for a period longer than 120 months, the Accelerated Benefit Payout provision will be triggered and the policy will pay the remaining monthly benefits to age 65, 67, or 70 as a lump sum without any additional definition restrictions. If the insured person is totally disabled for a period longer than 120 months, the Accelerated Benefit Payout provision will be triggered and the policy will pay the remaining monthly benefits to age 65, 67, or 70 as a lump sum without any additional definition restrictions.